Get the best deal for 3-day hog hunt! Food and lodging included in all hunting packages except 1 day hunt. Add $150 a day if you are wanting to do a combo deer / hog hunt. 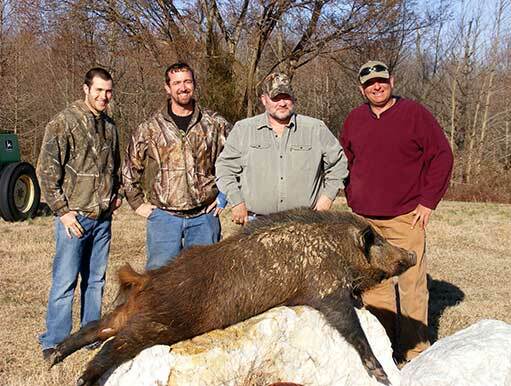 For our Hog Hunting we have put together a special package that most all of our hunters like. This package was built by us and the request of our hunters over the passed 10 years. Arrive on Thursday midday, Your hunt starts that evening. You hunt that evening and night. Hunt Friday evening and night, Saturday evening and night and depart on Sunday morning. This package includes food, lodging and your guide. Tips for your hard working guide or guides are not included and not mandatory but these guys are working hard for you right now. The way our hog hunt works… We start your hog hunt on the day you arrive. Depending on the hog movement we will hunt the evenings . As most of you know hogs are very very smart and very nocturnal. So we normally have to hunt them at night. Here at Hog Heaven Outfitters we supply all our hunters with the equipment that they need for night hunting. We use the best hunting lights that we have found on the market today. And of course they are our very own Assassinator hunting light kits. These kits have everything you will need for you an awesome night hunting experience. We mount the AS 900 light to the scope of your riffle and off we go. Night hunting is an experience that everyone needs to have and that everyone loves to do. Now if you own your own night vision equipment, bring it on. We put our clients in the stand and you remain on stand until your guide picks yu up. You and your experienced guide will determine a time to pick you up. We have alot of our hunters stay on stand until they kill, shoot or just ant stand sitting there any longer. Wow yes we can hunt 24 hrs a day!!! The reason for the $150 plus a day rate to make it a combo hunt is that your hunt will change. Its a lot of work on your guides to make a deer hunt a combo. You will practically hunt almost 24 hrs a day. I will explain when we talk.